Increasing societal investments are required for people to acquire school diplomas, although their benefits are open to question. Each individual’s abilities are much more essential than diplomas and titles. They make it possible for people to work in several different occupations and help them cope with the uncertain situations of life. Before today, schools trained people for specialized occupations; today they must equip people for the uncertain global reality: to work in surprising situations and in occupations that may still be completely unknown. The solution is cooperative-based Team Entrepreneurship, which has been developed at Tiimiakatemia® in Jyväskylä, Finland, for twenty (20) years and has already spread extensively outside our country’s borders. In cooperatives, learning takes place in practical financial endeavours. Cooperative-based team entrepreneurship develops the individual, together with others. Cooperative members—team entrepreneurs—are employees and entrepreneurs all at once. In cooperative-based team entrepreneurship, inspiration, enthusiasm, and the best human values are accepted in business. You cannot achieve anything without taking risks. 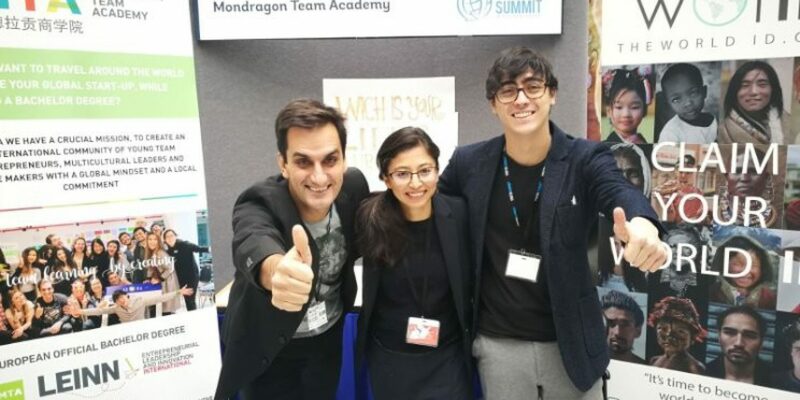 With the objective of democratizing entrepreneurship, making it available to all and not just to “the best”, José María established an undergraduate degree (LEINN – Leadership Entrepreneurship Innovation) aimed at students aged 17-25, within Mondragon University, based in the Basque Country. He soon realized that in order to keep the necessary link between these young people and their local communities, the model needed to be multi-local, and promoted and accompanied the opening of other local labs situated in and outside the Basque Country. To date, 9 international labs have been established with the goal of reaching 20 labs by 2020. Throughout the degree’s four years, the students are encouraged to “re-learn” everything they know and are taught to become team players. From day one the students create a “team learning cooperative” (legally presented as an association) based on their interests and personal abilities. By the second year, the business becomes a “junior cooperative”, a new legal concept that MTA introduced in the Basque Country legislation. During the third year, the joint venture becomes a real cooperative, paying its taxes and social security, while the fourth year is dedicated at scaling and expanding the business’s outreach. Throughout the 4-year process, the students (or “LEINNers”) go on Learning Journeys, with expenses covered by the revenue generated from their own cooperatives. The trips include Finland, to understand and experiment the innovative education system, San Francisco (Silicon Valley), to discover the cradle of entrepreneurship; India, to connect with a radically different social context and social entrepreneurship; and finally China, in which they are encouraged to scale up their business projects addressing one of the biggest emerging economy and find new potential business partners. As well as providing a global experience far different from their own environment, these journeys have a strong social component, ensuring that the students are aware of the intrinsic social nature that all enterprises must include. Thanks to that Mondragon Team Academy creates passioned teampreneurs blooming ourselves to create globally radical positive impact together.